The Vishwa Hindu Parishad (VHP) was founded in 1964 by a group of senior leaders from a hard-line Hindu organisation, the Rashtriya Swayamsevak Sangh (RSS), to give Hindus what they believed would be a clearly defined sense of religious identity and political purpose. Its founders felt the need to present Hinduism in a rigorous though simplified form which would be comparable to most other world religions. The superiority of other faiths was believed to stem from their being far less diffuse and more uniform than Hinduism. But its critics call the VHP a hardline Hindu outfit with unmistakably close ties to its parent organisation, the extremist RSS, whose objective to 'Hinduise' the Indian nation, it shares. The VHP has tended to tone down the rhetoric of Hindu supremacy and even make an occasional distinction between fellow (Muslim) citizens of the present and (Muslim) 'marauders' of the past. But the ambition of establishing a resurgent Hinduism by inculcating what some historians call a carefully constructed common 'Hindu spirit' is very much central to the VHP. This is also something it shares with the Bharatiya Janata Party (BJP), which currently leads the Indian Government at the centre. Earlier known as the Bharatiya Jana Sangh (BJS), the BJP was established in 1951 as a political wing of the RSS to counter rising public revulsion after the revered independence figure Mahatma Gandhi was assassinated by a former RSS member. Some commentators say the party came close to obliteration in the 1960s with the Congress led by the charismatic and secular Jawaharlal Nehru, leaving little room for hardline communal politics. But a political emergency announced by Nehru's daughter, Indira Gandhi, in 1975 enabled the BJS leaders, Atal Behari Vajpayee and LK Advani among them, to gain near stardom after serving brief prison sentences. But it didn't really emerge as a political presence until the early 1980s. A series of events in that decade including the mass conversion of lower-caste Hindus to Islam pushed the BJP's close affiliate, the VHP, to the forefront. Historians say the VHP-led Hindu right considered the mass conversion of "dalits" or lower-caste Hindus to Islam to be an unforgivable insult. The dalits, for centuries beholden to the upper castes, outraged Hindu hardliners by daring to convert at all, and moreover, convert to Islam. The VHP saw this as a serious threat to its notion of Hinduism. It proceeded to whip up Hindu support for a re-defined communal force, organising a series of religious meetings, cross-country marches and processions through the 1980s. 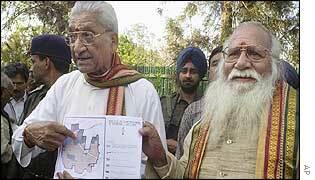 This phase coincided with the launch of an electoral strategy by the BJP to corner and hold on to the "Hindu" vote. Following the success of their campaign, senior VHP leaders announced at a religious meeting in 1984 their programme to "liberate" a site in Ayodhya from an ancient mosque to make way for a temple to the Hindu god Ram. Analysts say this announcement heralded a turning point in the history of the Hindu nationalist movement. The VHP has since then claimed that the site belongs rightfully to Hindu worshippers who believe that the mosque stood on the birthplace of the god, Lord Ram. Although the claim does not stand up to substantial archaeological or historical scrutiny, the VHP and BJP are seen to have made possible the creation of a shared Hindu symbol that cuts through most divisions in Hindu society.